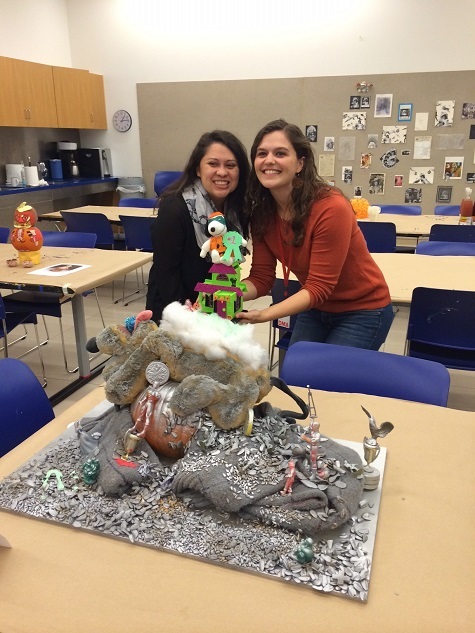 The always creative DMA Education Department celebrated Halloween with a Museum-inspired pumpkin decorating contest. Staff members paired off and created a patch of pumpkins disguised like works in the DMA’s collection and special exhibitions. The pumpkins were judged by a team from the Exhibitions and Curatorial departments. 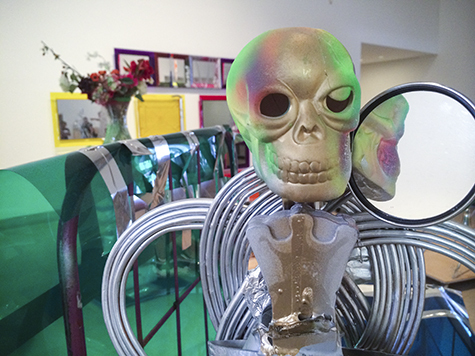 An Isa Genzken re-creation took home the coveted Great Pumpkin Prize. We hope everyone has a safe and happy Halloween! 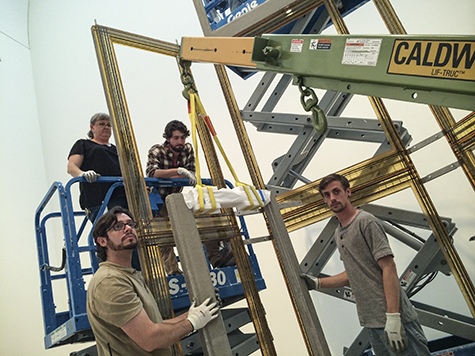 Isa Genzken: Retrospective, currently on view in the DMA’s Barrel Vault, arrived in Dallas after presentations in New York and Chicago, and came together after weeks of installation. Each work of art required a different approach and took varying amounts of time to place on display. 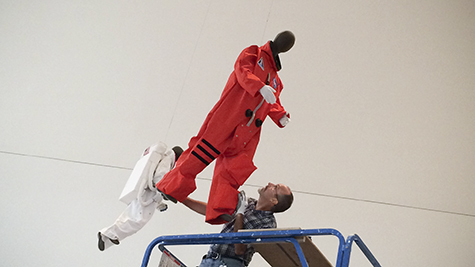 Below, watch the installation process of Genzken’s 2007 work Oil XI, which invites you into the exhibition. Visit it now for free through January 4, 2015. 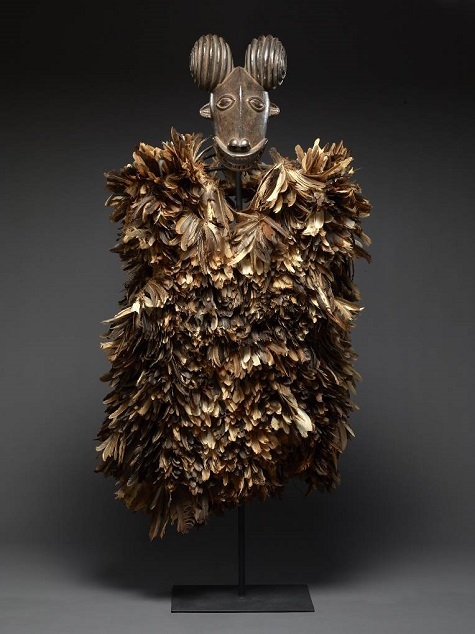 This mask depicts a ram, an animal that is sacrificed in religious rituals. While the face of the animal is carved naturalistically, the horns are designed as two stylized spherical knobs composed of concentric rings. 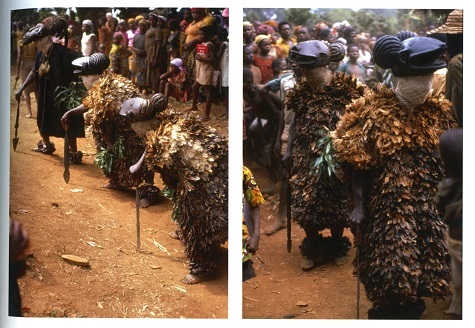 When the mask is worn, it fits snugly on top of the dancer’s head and the dancer’s face is concealed under a fitted hood. The dancer also wears a costume of chicken feathers. 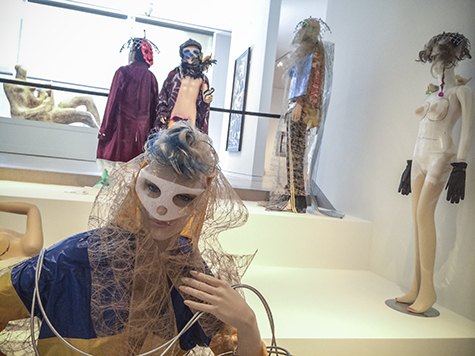 While we are interested in visitors being able to explore the sensory elements of this piece, including the texture of the materials, the weight of the mask, the sounds of a masquerade, and the sight of the feathers in motion, this month we will focus activities in the C3 on mask making. If you were to create a mask symbolic of yourself or an event in your life, what animal would you choose as a symbol, and why? Additional works from our African collection have recently been installed in the African Galleries on Level 3, including the new acquisition of a sword ornament in the form of a spider. In conjunction with the current exhibition Isa Genzken: Retrospective, on view through January 4, 2015, the Center for Creative Connections is showing two films by Genzken in the C3 Theater. On weekdays you can see Chicago Drive, a 16mm film made in 1992 while Genzken was in Chicago preparing for her Renaissance Society exhibition. It reveals her fascination with local architecture, both the famous and the mundane, and also includes intermittent blues music on the soundtrack. On the weekends, My Grandparents in the Bavarian Forest will be on view. This 63-minute film has English subtitles and is a personal account of Genzken’s grandparents’ home in southern Germany. Through the recording of seemingly banal conversations and her grandparents’ quotidian rituals, Genzken draws a moving portrait of the complexity of family dynamics, and the difficulty of coming to terms with the survivors of the World War II generation. 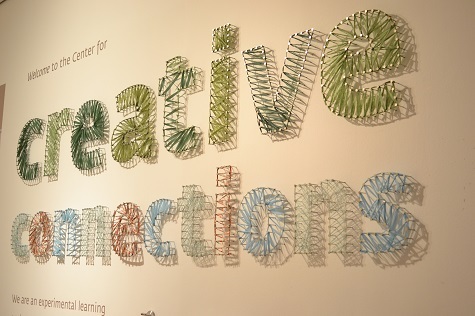 This week artists Lesli Robertson and Natalie Macellaio have been on hand in the Center for Creative Connections installing The Mother Load project, an interactive work that hopes to start a dialogue with visitors about the balance of nurturing in one’s life. The collaborative project began as a way to engage with women who lead the creative life of an artist while also being a mother. 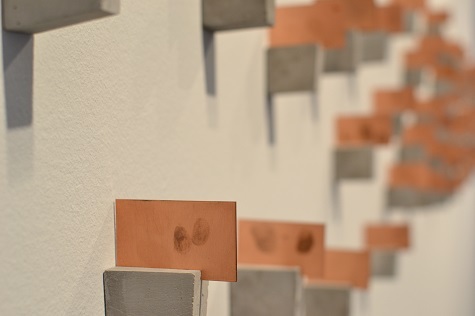 Through the project, Robertson and Macellaio are collecting fingerprints from artists and their children, recording experiences through written word and audio interviews, and documenting the ongoing project through their interactive website (themotherload.org). In the interactive component of the installation, visitors are asked to respond to this question: “In your life right now, what are you nurturing, and why?” Look for an upcoming post where we interview Robertson and Macellaio about The Mother Load. 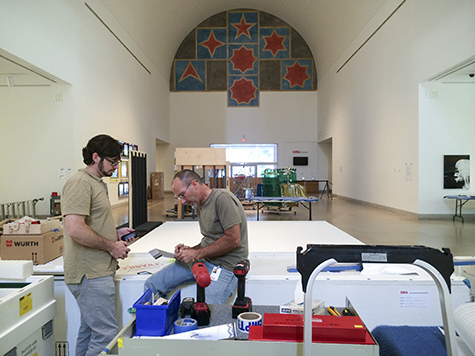 Jessica Fuentes is the C3 Gallery Coordinator at the DMA. Isa Genzken: Retrospective, the DMA co-organized exhibition with the Museum of Modern Art, New York, and the Museum of Contemporary Art Chicago, will open this weekend at the DMA as part of a successful national tour that has been described as “dazzling.” The DMA is the final stop for this first major U.S. exhibition of Genzken’s remarkable career. 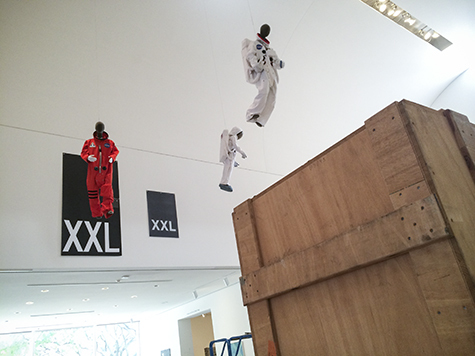 Her work contains many elements and the DMA crew has been installing the exhibition for weeks. Get a sneak peek below and then visit the exhibition, which is included in the DMA’s free general admission and is on view beginning this Sunday, September 14, through January 4.